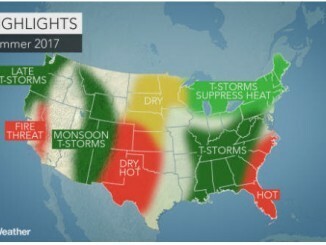 HomeScienceEnvironmentalFourth Of July Forecast: Where Will The Weather Threaten Barbecues, Fireworks? Fourth Of July Forecast: Where Will The Weather Threaten Barbecues, Fireworks? AccuWeather-(ENEWSPF)- Park Forest looks to be dry this Independence Day. However, that is not the case for the entire mid-west. 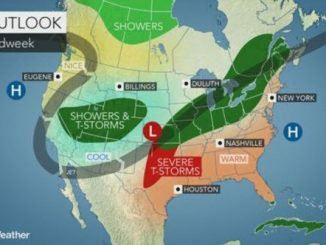 AccuWeather reports rain and thunderstorms will threaten parades, barbecues and fireworks displays across portions of the central and eastern United States and the Intermountain West on Independence Day. Keep up-to-date on the weather conditions across your area by using AccuWeather Minutecast®. Rounds of rain and thunderstorms will develop from portions of the mid-Mississippi Valley to the Ohio River Valley and the mid-Atlantic states on Independence Day. Some of these storms could produce a large amount of rain and lead to flash flooding. 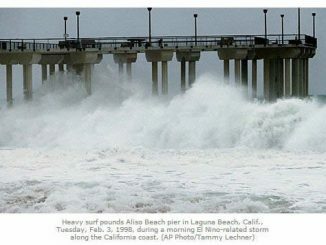 “There is the potential for 2-4 inches of rain to fall where the storms repeat,” AccuWeather Lead Storm Warning Meteorologist Eddie Walker said. Some of the strongest storms could also produce small hail, isolated wind gusts and frequent lightning. Where these thunderstorms are the most robust during the evening hours poses the greatest threat for fireworks shows to be delayed or canceled. “Evening fireworks displays could be in jeopardy in cities such as St. Louis, Louisville, Indianapolis and Cincinnati,” AccuWeather Senior Meteorologist Dan Pydynowski said. Thunderstorms are likely to be more spotty in nature farther to the south along the Gulf Coast states. “A typical smattering of thunderstorms will fire up across Florida during the afternoon, but many should dissipate by dark as fireworks get underway,” Pydynowski said. With the monsoon season underway across the Intermountain West, spotty showers and thunderstorms can develop during the afternoon and evening hours on Independence Day. Any thunderstorm that develops is likely to form over the mountains during the afternoon hours and drift toward the lower-elevation areas during the evening. As these tend to be slow-moving, flash flooding will be a concern where any storm develops. People in El Paso, Texas; Albuquerque, New Mexico; Aspen, Colorado; and Casper, Wyoming, should keep an eye to the sky and seek shelter should a storm approach. Dry weather to prevail across Northeast, Midwest, Plains and West Coast Sunshine will be in store across portions of the Northeast, Midwest, Plains and West Coast. Low humidity across the Northeast will favor excellent conditions for any outdoor barbecues or fireworks shows. Those spending the day outside across the Plains and Southwest will want to bring along sunglasses, sunscreen and plenty of water.